Hi, I'm using SAMD21 Xplained Pro board and am new to Studio and ASF but have experience with other IDEs and embedded platforms. I'm trying to get a basic USB CDC echo program working, but as soon as I enable the driver nothing else works. I've followed the start guides and the examples but still not luck. Then I added the USB. I modified the conf_usb and conf_clocks as per examples, except I haven't included all the optional event callbacks. If I leave the udc_start() function call in, the heartbeat stops and Windows reports that USB device not recognized. If I comment out the udc_start call then heartbeat starts working again. Is there some interaction between USB and systick drivers? The ASF stuff is supposed to just work, isn't it? In the ASF example the code uses the sleep manager, however the start guide and api reference state this is optional so I haven't included. This is getting really frustrating, as ASF is supposed to make things easier to get the application going, but I've now spent several days banging my head against the wall trying to get this going. Andrewjfox, have you had any luck with this? I'm working with a SAMS70 but am having similar problems with USB ASF. The device never recognizes, it just says failed to get descriptors in the windows device manager. Me too having issues with SAM E70. Am trying to get the USB Host working. But sadly it isn't working. I'll respond after going through the doc. On my ATSAME70Q21 I have it working, not sure if this is applicable for you, but for me there is an issue where the cache can't be enabled when doing USB. I do have my caches enabled, but have used the MPU to mark my SRAM sharable and now the USB is working and I still get cache benefits when accessing Flash. Maybe this can be improved more by relocating all USB memory into a single spot and only mark that sharable. I finally got the USB Device mode to enumerate with the SAMS70Q21 but I had to move away from ASF and use the samv71_softpack_1.5 libraries instead. There were some timing issues. If my processor was running at 240MHz I couldn't get it to enumerate unless I stepped through certain parts of the initialization code. If I changed it to 120MHz everything worked fine. I tried to monitor the status register to hold it until the clock was usable but it only works if I add this delay in. Ok, I'll try disabling the cache memory. That is a good news, but unfortunately almost 40% of the actual firmware has been developed using ASF. So, moving out of ASF would spell disaster. But I'll try that frequency modification technique of yours. Is it possible for you to share a sample code for that. Because we are really running out of time here. We are close to the deadline, lots of work needs to be done. ASF is really bothering me. I could detect the USB device connected but am unable to mount the device. I am still using ASF for the majority of my code as well. I only imported about 12-15 USB files from the samv71_softpack_1.5 libraries. Again I'm only using USB in device mode so I don't think my code is going to help in your situation, it's essentially code straight from the examples in the samv71_softpack_1.5 libraries. There are a lot more examples in the pack. Open one of the host examples and look at the specific files they imported. You'll have to remove the chip.h and board.h include statements in the files you import and find equivalent files and definitions in the ASF files. They are almost identical, but you may need to add a couple of definitions to the compiler.h and same70xxx.h chip file in your project. It took a couple of hours for me to get it to compile but it's completely doable. It seems promising, let me try it out. I really appreciate your help. Lets hope this works. I wonder why Atmel Support is not bothering at all. I tried contacting everybody in my reach, but nobody is responding. It seems like opting SAM E70 for our project was a big mistake. It is simply killing my time. Atmel Website is under maintenance. Am unable to download any file from their website. Even I have issues with getting my USB drivers to work properly for my same70q21. I wanted to try "marking my SRAM shareable". Can you tell me how you did that? I looked up online but couldn't find much information. I did find this(http://atmel.force.com/support/s...) document though. But I am so new to this I couldn't understand. I was recently (in Dec 2017) able to get the USB CDC echo working with the SAMG55 eval board and then on my custom board also. I too used the newer Atmel START/ASF4. So it is possible to get working. Clocking is an issue that is sensitive. There is an app note describing crystal-less USB clocking on the G55 but I was not able to get that to work and resorted to adding a 32KHz clock source that is then used to drive the PLL to generate the 48MHz USB clock. - Change the MCU clock rate; in the G55 the default was 8MHz which was too slow for USB. Changing it to 24MHz helps. This was under the clocks tab for the main clock. 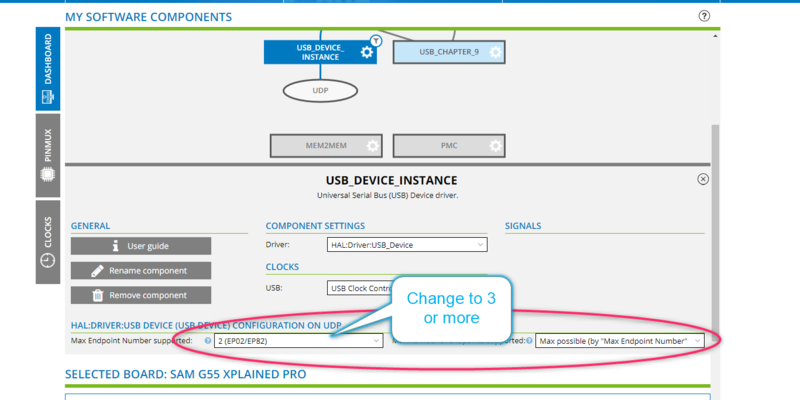 - Change the default bulk out endpoint number to 3 or higher; under the USB_DEVICE_INSTANCE settings. The example needs EP83 and it only limits it to EP82 here. I am using ASF3.32.0 for SAM E70-XPLD USB example. So its okay if I stick to ASF3? My PC never detects USB device. Going to check clock etc. 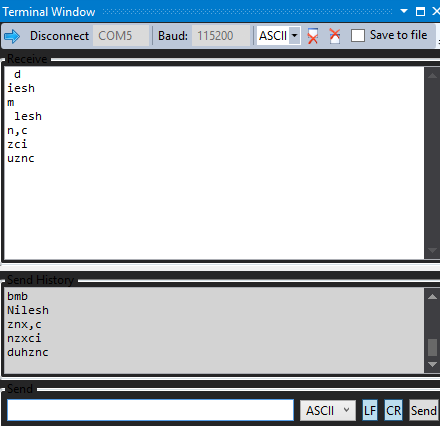 tarribred Thanks for the clue about ASF4, I have got CDC Echo running succesfully on SAME70-XPLD. But I want to configure the board as USB vendor class. No such example project found for the board. If someone has a clue about where to found such example code please share. Finally i got USB Vendor class device detected successfully on PC I created new project in ASF4/START. now trying to modify code not to loopback just transmit only. Hello all, I am transmitting data over USB (Project created in ASF4/START) I am unable to fine endpoint size please help me fine this or any documentation that can help me understanding the code? Here is my code not to loopback just transmit data assuming 1024 packet size. No data appearing on analyzer. P.S: Web is not allowing me to decorate code using < >. Web is not allowing me to decorate code using < >. This is a long-standing bug - Microchip must know of it by now. My code stucks at vendordf_is_enabled(); figured out using GPIO toggle. Anybody can please help? So use your debugger to step into that code, and see what it's waiting for, then! Thanks tarribred, Code attached there is designed using ASF3, whereas I have now shifted to ASF4/START the code is totally different. No help is available on internet. I have issue with SAME70 board.